Howard Construction, Inc. is a general contracting business specializing in Quality Custom Homes, Remodeling, and Commercial Construction. We can work from your plans or work with you and design to your specifications. What sets us apart from our competition is that every job is given our highest level of attention. We strive to build every home with the upmost quality and attention to detail as is possible. We at Howard Construction, Inc. want your building experience to be the best it can be by having you feel assured that we are looking out for your interests in every aspect - from design to functionality to finished product. 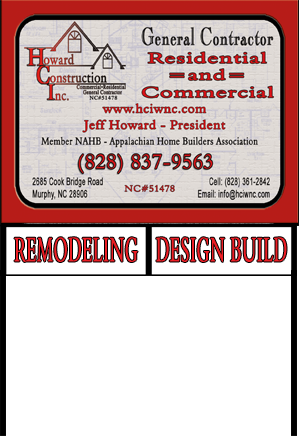 Jeff Howard is the president of Howard Construction, Inc. He is a general contractor, license #51478. Jeff has had over 42 years of experience in the building industry. He is also a founding member of the Appalachian Home Builders Association. Jeff presided as president for three and half years and now sits on the board of directors. Board of Directors and one of the founders.